Aquegel Cold & Flu is commonly used to moisturize dryness due to: Severe Cold & Flu Virus Symptoms, Inflamed nasal passages associated with the Cold & Flu Congestion. 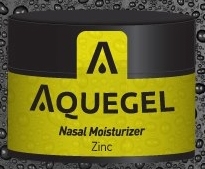 Aquegel Original is the only moisturizer that contains the perfect concentration of Zinc which makes it an EXCELLENT moisturizer for: Creating a moisture barrier of Cold & Flu FIGHTING ZINC to DECREASE the likelihood of the onset of a Cold or Flu Virus! Creating a moisture barrier of ZINC that STOPS the Cold & Flu Virus from replicating to DECREASE the duration of a Cold or Flu! Ingredients: Light hydrocarbon oil, Distilled Water, Methylcellulose, PEG, Zinc Gluconate, Sodium Chloride, and Benzyl Alcohol.